A variation of classic shortbread recipe, Brown Sugar Pecan Shortbread follows the time-honored ratio for this cookie’s traditional three key ingredients: one part sugar, two parts butter, and three parts white flour. 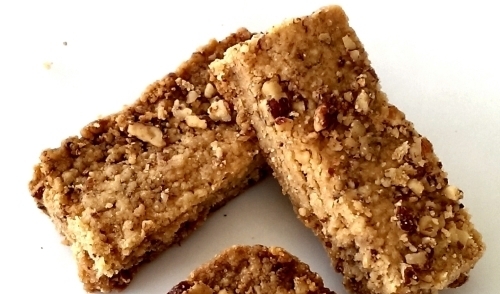 This version is even richer than traditional shortbread, thanks to the brown sugar and pecans. Divide the pecans in half. Finely chop ½ cup. Coarsely chop the other half. Set pecans aside. In a medium bowl with an electric mixer on medium speed, cream butter and brown sugar until fluffy. Gradually beat in the flour and salt, mixing until the dough is well-blended and begins to form large crumbs. Mix in finely chopped pecans. Press dough evenly into an ungreased 13 x 9 baking pan. Use the heel of your hand to smooth the surface. Sprinkle coarsely chopped pecans onto the surface. Press down pecans so they adhere to the dough. Bake shortbread for 25-35 minutes until edges begin to brown. Remove the pan from the oven. While shortbread is still warm, use a sharp knife to slice cookies into thin bars, ¾ inch by 1 ½ inches. Let shortbread cool completely. Use a knife to re-cut the scored bars so they loosen easily. Use a spatula to remove bars from the pan. Set your knife in the refrigerator before you begin to prepare the dough for Brown Sugar Pecan Shortbread. A cold knife cuts the shortbread more cleanly and creates smoother edges.